The Meyer Nite Saber III Snow Plow Lights replaced the Meyer Nite Saber II Snow Plow Lights as the new standard light that comes with all Meyer plows in mid 2016. the Nite Saber II Snow Plow Lights have been discontinued by Meyer Products and are (NLA) No Longer Available from Meyer Products. 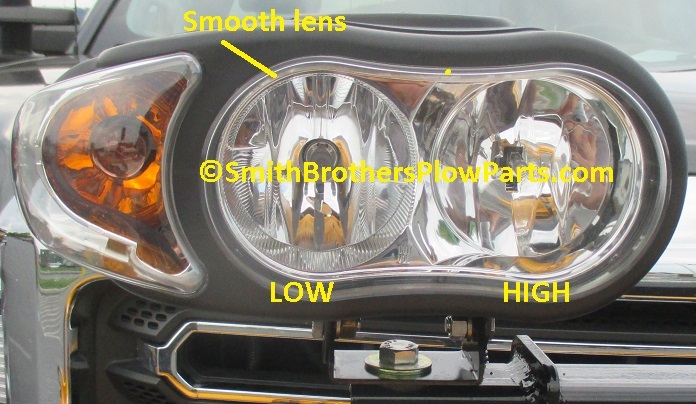 The Light Housings are the same, but internally they are different, and the Lens is different, AND the low beam is now on the "outside" whereas on the Nite Saber II the low beam was on the "inside". Once again I need to point out the stainless steel hardware. Meyer is the ONLY plow manufacturer I am aware of at this time that uses stainless steel hardware. This, with the bracket design means adjusting your plow lights will ALWAYS be easy. More on that below. Looking at the Nite Saber III from the front, it is hard to tell it is different from the Nite Saber II. The smooth lens and position of the high and low beam bulbs is the only give-away. 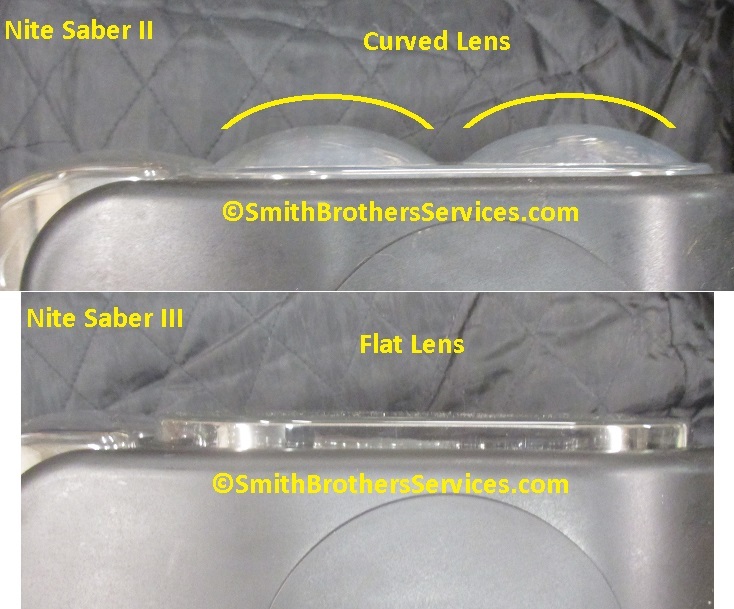 Side by side top view you can see the difference in the Nite Saber III lens vs. the Nite Saber II curved lens. Here is the mounting bracket. You can see there are two tabs on the inside. 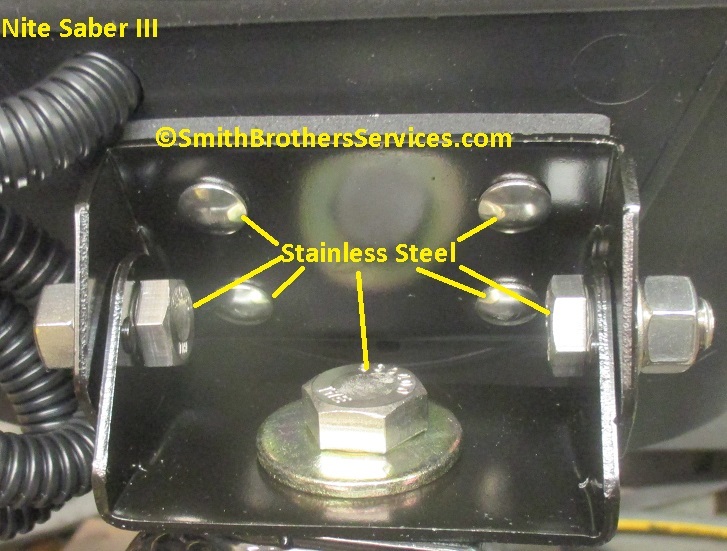 These tabs hold the head of the stainless steel adjusting bolt in place. This is why the lock washer goes on the outside!! I get SO MANY plows in where the installer put the lock washers on the inside, and it crushed the tabs. 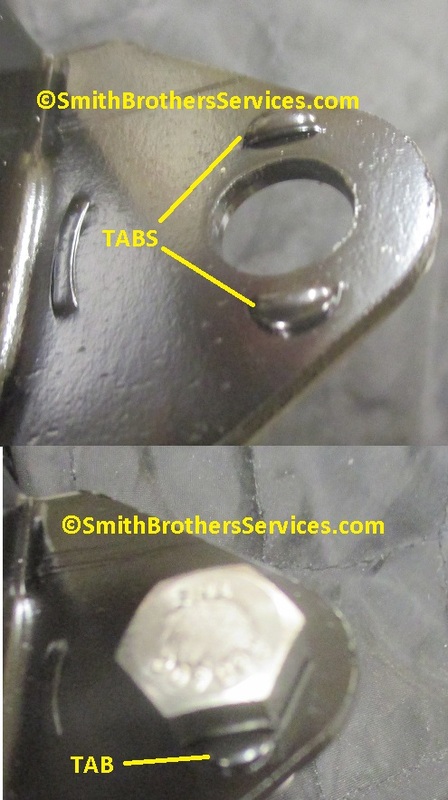 The tabs hold the heads of the bolts, so you only need one 9/16" wrench to loosen the nuts a little to make an adjustment. 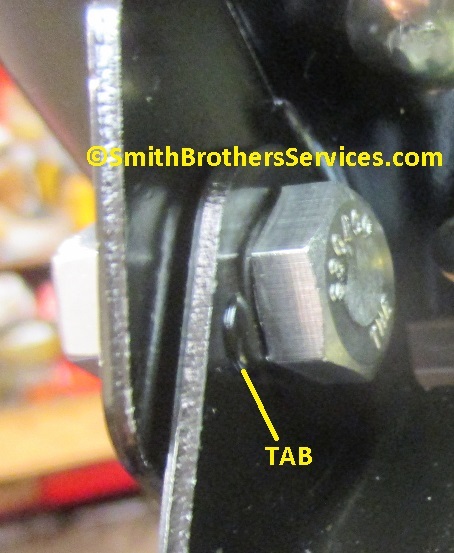 Once the tabs are crushed, you will need two wrenches to make adjustments! 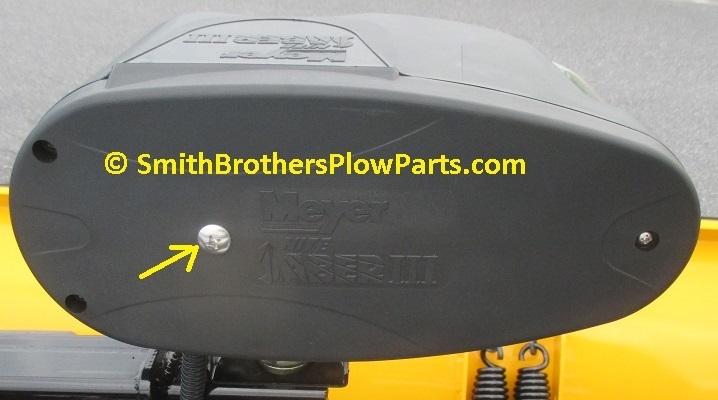 Looking at the back of the light, you can see a large #3 Phillips head screw has been added when compared to a Meyer Nite Saber II Snow Plow Light. This secures the back of the light to an internal steel bracekt that gives the light much more support compared to the Nite Saber II. A look at the steel bracket inside the light. It sits on another rubber pad like the one on the outside of the light to better isolate the Nite Saber III from vibration. Overall the Nite Saber III is an improvement over the Nite Saber II, which was a good light. Mine on my personal use plow are about 7 years old, with no problems. I say it is an improvement, because I kid you not, the Nite Saber II had problems with vibrations coming from the plow when PLOWING in excess of 30 MPH!!! Not to mention the recoil after the plow would trip when plowing over 30 MPH. Newsflash, if you are going to plow at speeds over 15 MPH be ready for it to get expensive. The faster you plow the more expensive it will be to repair what you damage. Abuse is not covered by ANY manufacturers warranty. Meyer Nite Saber 3 Plow Light Kit includes Modules. DOES NOT INCLUDE HEADLIGHT ADAPTERS! Check "Related Items" here if you do not need modules. We have them too. Read Full Desc. Meyer Nite Saber 3 Plow Lights - NO MODULES. This is what you want if you want to replace your existing Nite Saber or Nite Saber II lights. 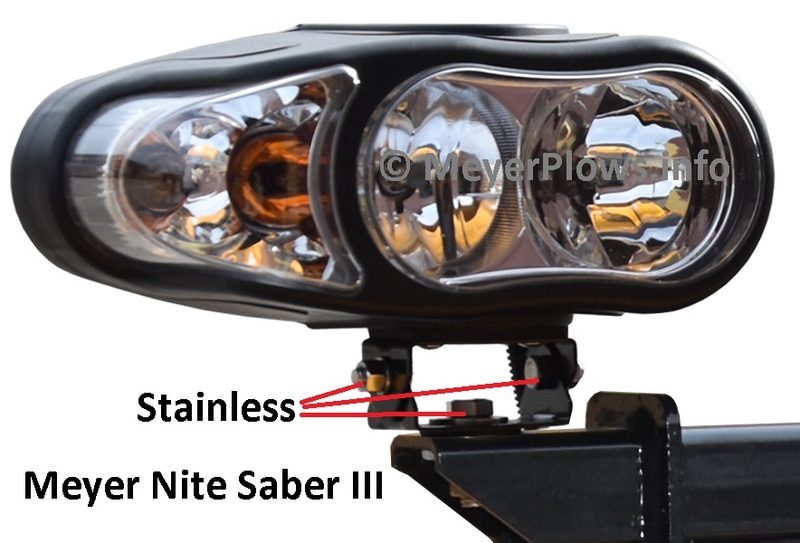 This Meyer Nite Saber 3 Plow Light Kit does NOT include Modules. Click on Related Products tab for more options. Meyer Nite Saber 3 Plow Light Kit includes Modules. Also includes Headlight Adapters of your choice normally priced at $64.12.Read Full Desc. Genuine Meyer Nite Saber Headlight Module Kit Meyer Part# 07548. Includes the NEW STYLE 07347 modules that have replaceable fuses. 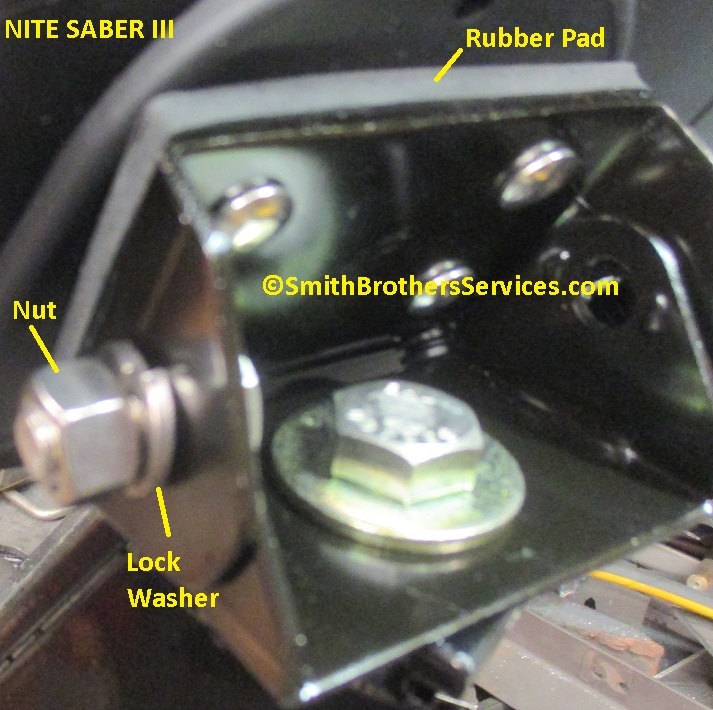 Meyer Nite Saber 2 replacement Turn Signal Socket. 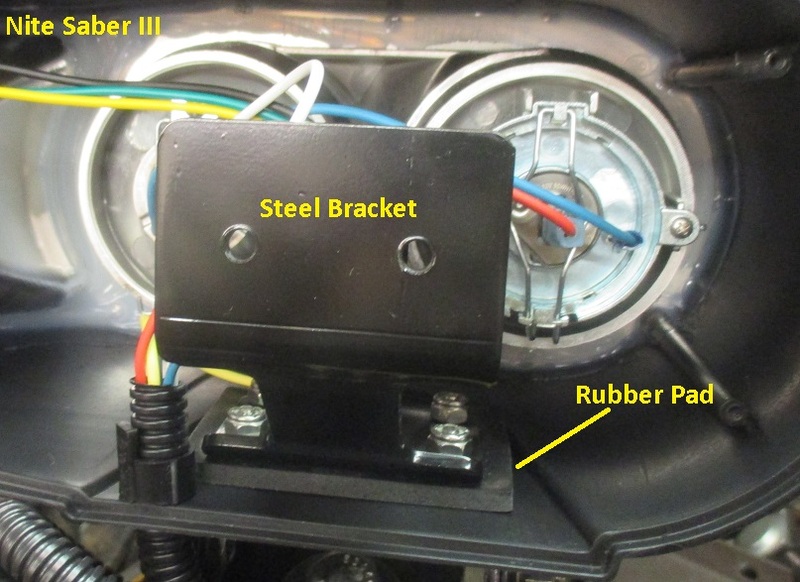 It is not uncommon for the green wire on the original Turn Signal Socket to break off right at the back of the Socket. Here is a replacement Meyer Nite Saber 2 Turn Signal Socket. Meyer does not even offer this part. WE DO. Meyer Nite Saber II Nite Saber III Hardware Bag C (Light Mounting Brackets) for BOTH Nite Saber II Plow Lights. Also fits Nite Saber III. LIGHT NOT INCLUDED. Common Misspellings: Meyer Nite Saver, Meyers Light Saver, Myer light saber, Meyer Nite Sabre, Saver Plow Lights, Meyers Night Sabers, Meyers Light Savers.